Most often, people get confused between being an Entrepreneur or a Freelancer. Although in both the cases the person is fiercely independent and they work for themselves, maybe managing a team and/or hiring people. But if we observe the thin lines of accomplishing goals and creating plans for expansion, then both freelancer and entrepreneur are as different as strawberry and gooseberry. A freelancer is a person who gets paid for the work. He may charge based on the hours consumed in finishing that task or based on per project. Some of the most common professions where freelancers are pretty much active are: Writing, Designing, Consulting, Coding, Advising, Filling Taxes etc. An entrepreneur is a person who uses money (either his own or someone else’s) to create a business and make it bigger than himself. Entrepreneurs focus on the growth and expansion of the business more than just revenues and profits. Scalability is the keyword here. The goal of a freelancer is to provide higher quality of work so that his hourly compensation or project charges increases gradually. The freelancer, at heart, wants a steady, long term ‘job’ with no bosses around. It is the skills which a freelancer has that have value. Contacts, networking and knowing influential persons in the industry matter heavily for a freelancer. When a freelancer says he built something, he usually means that he wrote it, painted it, shot it, designed it or programmed it. Freelancers are more or less associated with creating art and craft. When an entrepreneur says he built something, he will usually mean a mega business, for which he hired people to create it. It can be an idea, a product or a service. Internally, an entrepreneur thinks huge, and would want his business to scale to infinite lengths. – In his younger days, an entrepreneur must have been selling things to his friends and making money while still being a student. A typical entrepreneur couldn’t accept things at face value, whatever is his age. Buying and selling stuff for small profit is a trait which has been observed in lots of entrepreneurs, all over the world. – On the other hand, a typical freelancer in his younger days must have been playing games all through the night, or drawing comics or writing something or the other at the back of his school textbooks. Money or talk of money normally frightens an artist! The transformation from a freelancer into an entrepreneur is tough, but not impossible. There are some entrepreneurs who started as freelancers and made it big. But the important thing is to identify yourself either as an entrepreneur or a freelancer so that there is no confusion and ambiguity. Can you identify yourself within these traits? Who are you, entrepreneur or freelancer? 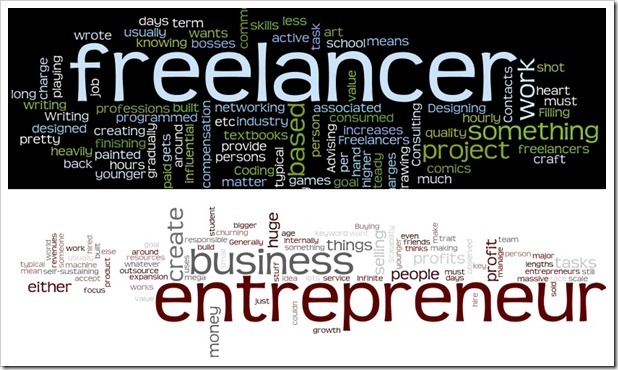 "Entrepreneurship or Freelancing? Identify Yourself With These 8 Personality Traits", 5 out of 5 based on 1 ratings.